This article applies to Office Home & Business, Office Professional, and individually purchased Office apps. If you bought multiple copies of Office and used the same Install button to install Office on multiple PCs, activation fails on the other PCs. This happens because each Install button is associated with a unique product key that can only be installed on one PC. To fix this, you can change the product key for the other PCs where you installed Office. Note: After you change your product key, we recommend that you create a list to manage the product keys that you've installed. To learn how, see Manage multiple one-time-purchase Office installs that use the same Microsoft account. Select your Office version below. On the device where you want to change the key, open any Office app, select the File menu and then select Account near the bottom of the menu. If you're signed in, select Use a different account, and then select Enter product key instead. If you're not signed in, select Enter product key instead. Enter your Office 2019 or Office 2016 product key, and then select Install this product instead. If your product key is new, follow the prompts to complete the redemption process. Office begins the update process. Close all Office apps to finish the process. Uninstall Office from the PC where activation is failing. To do this, see Uninstall from a PC. On the PC where you uninstalled Office, sign in to your Services & subscriptions page with the email and password associated with the Microsoft account that was used to install Office. Reinstall Office by selecting Install Office for a one-time purchase that hasn't been activated. For help with installing Office, see Install Office on your PC or Mac. To switch an Office install to or from Office 365, see Switch your Office license. Sign in to your Services & subscriptions page with the email and password associated with the Microsoft account that was used to install Office. After you sign in, you should see a list of Office products that are associated with your Microsoft account. For the first product that's listed on the page, select View product key. Copy or write down the product key. This is likely the product key that was used multiple times to install Office. Select View product key for the remaining Office products and copy or write them down. These are likely the keys that you'll use to replace the key that was used multiple times. Select the Start button (lower-left corner). Right-click the Command Prompt icon, and select Run as administrator. From the drop-down list below, select your Office version and Windows version (32-bit or 64-bit) and run the commands as described. Tip: If you get an Input Error: Can not find script file... message, it means that you used the wrong command. Don’t worry, running the wrong command won’t hurt anything. Double-check your Office and Windows versions and try a different command. Copy the following command, paste the command into the Command Prompt window, and then press Enter. The command prompt displays the last five characters of the product key that was used to install Office on the PC. Our example below uses XXXXX to represent these characters. Copy the following command, paste the command into the Command Prompt window, and replace XXXXX with the last 5 digits of the product key that was shown in the previous step. Press Enter to remove the product key. Copy the following command, paste the command into the Command Prompt window, and replace XXXXX-XXXXX-XXXXX-XXXXX-XXXXX with an unused product key from your list. Press Enter to change the key. The default installation for Office is 32-bit but if your PC has more than 4 GB of RAM, you probably have 64-bit Windows. 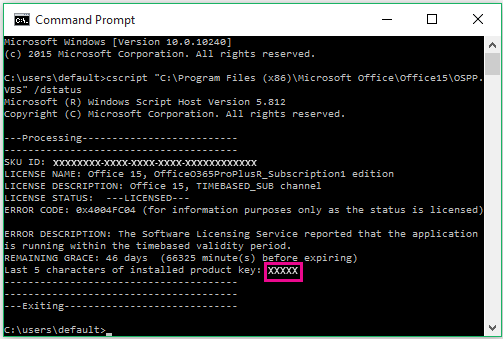 If you don't know which Office version is installed, see What version of Office am I using? To check whether Windows is installed as 32 or 64 bits, see Which Windows operating system am I running? Now start an Office app, such as Word, and select Next to activate Office over the Internet. Repeat this process for each PC where activation is failing.